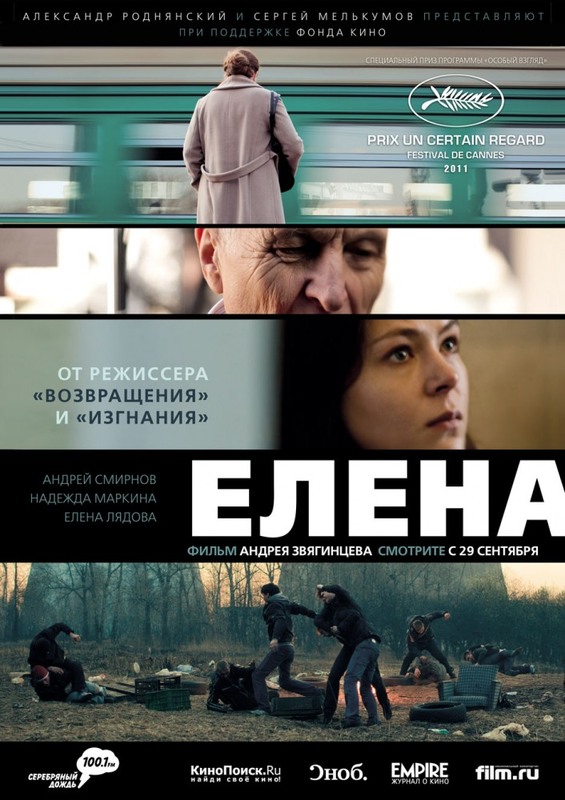 Elena (Елена) is a 2011 drama by Russian director Andrei Zvyagintsev (Андрей Звягинцев). Zvyagintsev is also well-known for his films The Return (Возвращение, 2003) and Leviathan (Левиафан, 2014), among others. Elena stars Nadezhda Markina (Надежда Маркина), who received a Nika Award for her role, and Elena Lyadova (Елена Лядова), and has music by American composer Philip Glass. It received a Golden Eagle Award for Best Film, and the Special Jury Prize of the Un Certain Regard at the Cannes Film Festival. Elena is set in contemporary Moscow, and one of its main themes is the class separation in Russian society. Elena is a woman from a lower-class family who has married Vladimir, an elderly business man who has been supporting her financially and with whom she has been living for eight years. Both Elena and Vladimir have children from previous marriages: Elena has an impoverished and infantile son who is unable to provide for himself or his family; and Vladimir has a spoiled and carefree daughter, Yekaterina (played by Elena Lyadova). Elena’s grandson Aleksandr needs money to pay for university admission or else he will be drafted into the army, and she asks her husband for the money. Before he can make his decision, Vladimir suffers a heart attack and ends up in the hospital where, after a conversation with his daughter, he refuses Elena’s request and, moreover, informs her that all his wealth (aside from a pension) will go to his daughter, Yekaterina, after his death. Desperate, Elena poisons Vladimir with an overdose of Viagra and burns the not-yet-official draft of his will that would divert the money to Yekaterina. As a result, Vladimir’s wealth is split between Elena and Yekaterina. In the finale of the film, we find Elena and her family living in the luxury Moscow apartment that used to belong to Vladimir. The film is slow-paced and realistic, acting, as do many of Zvyagintsev’s films, as both art piece and social commentary.